Does that barn look like it is on fire? Don’t worry, it is supposed to look like that. 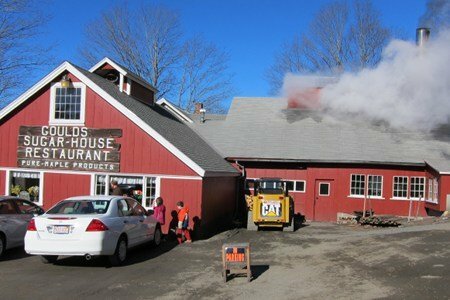 Here in Massachusetts, it is maple syrup season and that is steam rising up from a large metal stove. The farmers are making maple syrup and while some of you think there is no healthy sugar - this one has zinc and manganese and is made with minimal processing. For a mere 17 calories a teaspoon, maple syrup is much healthier for you than regular sugar. I found out about this miracle sugar here in Massachusetts. A sign that spring has arrived is that the "sugar shacks" start production. 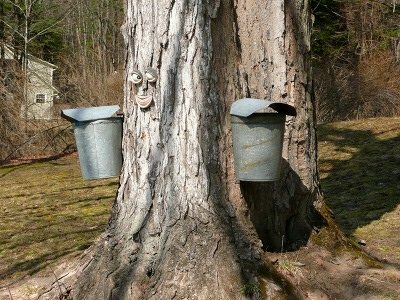 The cold nights and the warm days make the sap run out of the trees into buckets. Here is a photo of the inside of a sugar shack. The buckets of sap are dumped into this large metal boiler. 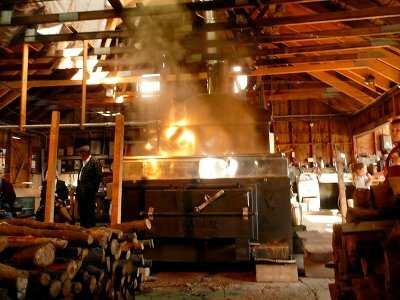 This is a tank that is heated with sustainable wood, and boils the sap from the maple tree. It takes 40 gallons of sap to make one gallon of maple syrup. They boil it down and then bottle it and that is it! The first people to figure out how to harvest and process the sap were the Native Americans - and nothing (except the size of the operation) has really changed from their methods. Maple syrup is simply "boiled tree juice" and when you are looking for a way to sweeten your food, I think it is a great choice. Of course, it is a lot more expensive than corn based syrups, but you can use the cost to your advantage. If you pay more for something, you tend to be aware of how much you use it, which is good thing with a high calorie food like maple syrup. Use it sparingly on your pancakes or in your yogurt and take time to enjoy its flavor. Do you like maple syrup? Please share below. Should You Avoid Fruit Because It’s Full Of Sugar? I love maple syrup! Ohhh, the sweet smell and the wonderful taste! I swear I could drink it!! We have a maple farm in the next town and after visiting it I fell more in love with maple syrup. The process is amazing. My favorite way to use maple syrup is a salad dressing. Equal parts of maple syrup, Dijon mustard, balsamic vinegar, and minced fresh garlic! It is super yummy especially on a strawberry/ spinach salad! I agree maple syrup is wonderful and I also try to buy from local New England sources. And I assume the natural product is generally better than refined sugar in lots of ways. But I think the calorie count I similar, right? Other than having zinc and magnesium, is it really "much healthier for you". Ps- I love syrup on oatmeal and cereal. I pour a bit of maple syrup over old fashioned oatmeal (after cooking). I then sprinkle it with chopped walnuts and dried cranberries as well as a bit of cinnamon and a tiny pinch of grated nutmeg. Makes a totally yummy breakfast! Thank you SG for sharing about the processing! I love real maple syrup and use it all of the time. My favorite recipe is my homemade granola bars http://partykitchen.wordpress.com/2013/01/10/homemade-granola-bars/ which has real maple syrup as a sweetener. Lately, I have been making the following parfait for breakfast: one sliced banana, plain yogurt, sprinkle of almond slices and a teaspoon of real maple syrup. It kind of reminds me of bananas foster and it sustains me all morning! I have been using granulated maple sugar in all my baking for about a year now. I started buying the granulated maple sugar in bulk on line bcuz it is much cheaper than buying it @ the grocers. My family loves it & I love the fact that it is more nutritious! @Sm - I probably overstated the case for maple syrup - maybe I should have said a bit healthier. I just love it soo. @SG. The ideas in the comments are great. (Banana foster for breakfast!). I travel New England frequently and try hard to buy local syrup, even though it costs more. It just feels right, especially when the next batch is being boiled in the barn right out back! And I enjoy your blog. It's cool to see you're in Amherst. I'm watchful when blogs (or worse, "real" news sources) claim something is "a growing problem" or "getting worse" when there are no facts to back it up. But I know it's easy to do. So thank you for clarifying, and happy snacking. I'm coming from the land of maple syrup, and every single time I go back home I have to bring more than 2 cans of the real thing. Also an alcohol made with Canadian whiskey and maple syrup called Sortilège, you can only find it in Quebec. Yup! I love REAL maple syrup and can't see how people buy that sugar free stuff. To each their own, I suppose. I'm not fortunate enough to live in Maple country so I buy mine at Costco. I always remember Laura Ingalls Wilder and the Little House in the Big Woods where they boiled maple syrup and poured in on the snow to make candy. Love Maple syrup also....keep a bottle in my frig....haven't tried it on oatmeal tho, that is an idea...thanks Angela will try it in the morning :)And haven't seen Granulated Maple Sugar either...where do you buy it at Eileen ? My school had the 2nd graders make maple syrup each year. I fell in love with real maple syrup then. This year my husband and I tapped 30 trees around our house. We gathered 495 gallons of sap and boiled it down to 6.8 gallons of syrup!! Yummy! We enjoy it most on vanilla ice cream...or I make my own plain, organic greek yogurt then add berries and a little maple syrup! So delicious! Anyone have any good recipes for jelly/jam made with maple syrup? I want to try that this year. I love maple syrup in my coffee! @SG-do you know anything about the different grades of maple syrup and is there really a difference between the organic and non-organic maple syrups? I know that the darker, heavier grade maple syrups are more nutritious than the lighter grade A. So for anything I make that does not require the granulated I use a grade C syrup. The darker maple sugar syrups are from the bottom where there have settled more minerals, etc. It is thicker & stronger flavored than the light Grade A. Sometimes I have found the dark maple to be labeled "maple sugar syrup for baking". Has anyone tried German Rock Sugar from Teevana? Its costly but suppose to be all natural and 5 calories tsp. I have used that rock sugar from Teavanna; it is very good, great melted in teas... A bit pricy I think, but as good as a sugar can be!! I've heard that B has more I reals than and is healthier than A - didn't even know there was a C! - so that's what I buy. Harder to find but gooood stuff. Grew up in Western Massachusetts and am very familiar with Gould's Sugarhouse. I went to school with the Gould kids, and it's a wonderful family operation. Very true about boiling down the 40 gallons of sap into 1 gallon of syrup. Straight from the tree, it the clear liquid looks like water with a few tiny pieces of bark floating in it. By the time it boils down to the syrup, it is the lovely golden color and wonderful flavor we have all come to love. It's a liquid gold and a very magical process because the weather only cooperates for a very few weeks every winter...typically February, where the nights are cold and the days sunny and warm for the sap to flow. As a child I remember drinking from the bucket on the tree when my brother and I were tobogganing - lifting the lid and tipping the wooden bucket - it just tasted like water. My grandfather drilled the holes in the trees, put the tap into the trees, hung the wooden buckets with the covers, and waited for the magic to happen. He went from tree to tree to collect the syrup, dumping the liquid from the buckets into a galvanized tank that was on a giant sled pulled by his oxen. He took it home and boiled it down into become syrup. After the 40 gallons of liquid became 1 gallon of syrup, a special treat was to boil it down even further until it reached somewhere between the soft ball and hard crack stage, where you could drop it into cold water and it would be like candy. We would drizzle it over a dish pan of freshly packed clean snow, and have what was called "sugar on snow", twirling the drizzle off the snow with a fork and eating it like candy. Because it was so sweet, it was often served with sour pickles and saltines or fresh doughnuts. Wonderful memories of the annual "sugaring off" season!